Welcome to Double Treble, the ORIGINAL embroidered custom guitar strap shop. Design your own custom leather guitar strap using our exclusive tool! click here to start designing your custom guitar strap. See some of our happy customers and what they have to say about double treble custom leather guitar straps. 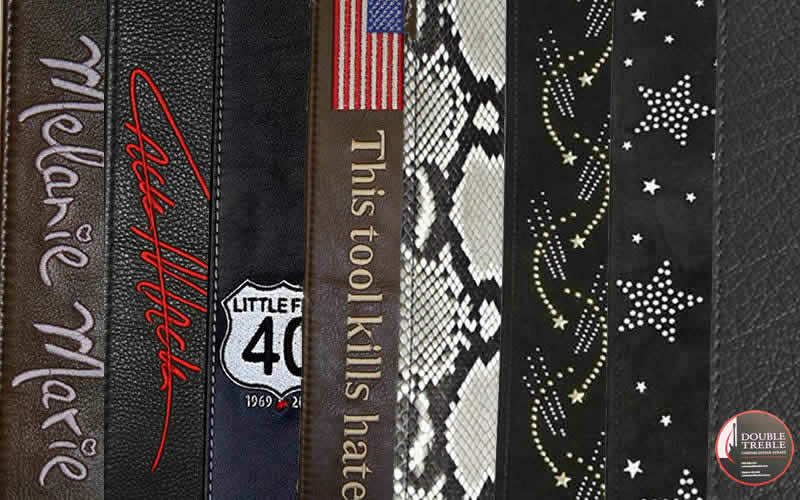 Billy F Gibbons Line Of Guitar Straps! Double Treble Guitar Straps is proud to introduce a new EXCLUSIVE line of straps, designed by Billy F Gibbons, the world renowned guitarist of ZZ Top. The guitar straps are individually hand made in the USA. Each guitar strap features a small stainless steel badge, laser etched with a logo of Billy F Gibbons and comes to you in a formal presentation tin. These exceptional guitar straps have it all, style, craftsmanship, and presentation and are now available to guitar slingers everywhere! 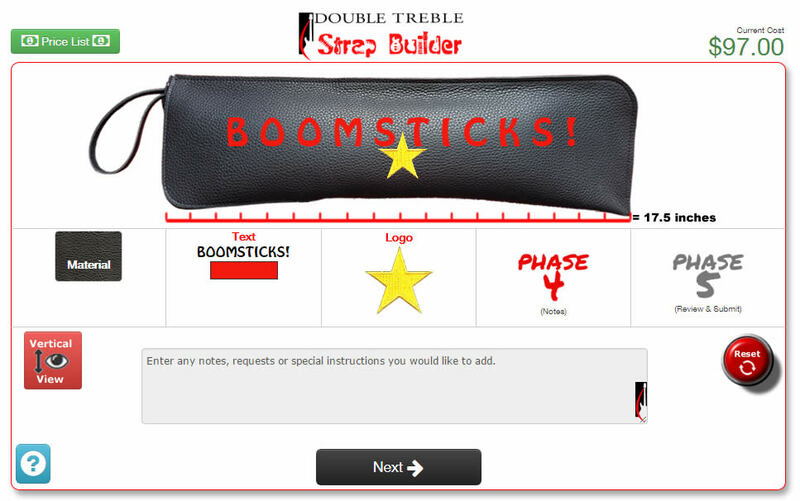 Design your own custom drumstick bag using our exclusive tool! click here to start designing your custom leather drumstick bag. Check out the variety of guitar straps we have to offer: Signature Leather Guitar Straps, Custom Embroidered Leather Guitar Straps, Python, Rhinestone and Buffalo Guitar Straps. All made from the highest quality materials. Its never been easier to interactively create the guitar strap, or drumstick bag of your dreams. We use the finest quality leather for our guitar straps. You draw it up... we make it... You Rock ! Click below to try it out. Billy F Gibbons and made by Double Treble. Rock out in style with a premium grade personalized leather guitar straps. Music is more than a hobby; it's a passion and a way of life. Frankly, there's no better way to celebrate this love of playing than by treating yourself to one of our high quality custom made leather guitar straps. Whether you're a novice or a pro, this is the perfect accessory for your setup. Rock on! Customizing your guitar with accessories is one of the best ways to further cement your love of playing and high end personalized leather guitar straps are the perfect solution. Not only do they provide a durable and comforting addition, but they also give your instrument a distinct look that helps it stand out from the crowd. Whether it's custom embroidered guitar straps, monogrammed guitar straps, or personalized guitar straps for acoustic guitars doesn't matter. We offer a wide range of colors, sizes, and design features to provide Personalized leather guitar straps that you'll fall in love with time and time again. You can carry your initial with Embroidered guitar straps, celebrate your passion for sport with custom made leather guitar straps or spread any other message o character trait with personalized leather guitar straps that are truly built around you. For high end custom leather guitar straps for electric guitars and personalized guitar straps for acoustic guitars, there's no need to look any further. We can produce high quality embroidered guitar straps and monogrammed guitar straps that are suited to bedroom rockstars, band members, and professional musicians alike. They can be used with virtually any brand and model of guitar while the high end custom made leather guitar straps are additionally built for long-term sessions. Our custom embroidered guitar straps also make fantastic gifts while the personalized guitar straps for acoustic guitars are particularly enjoyable for the new guitar player in your life. With monogrammed guitar straps, the recipient will never forget your lovely gesture. Frankly, personalized leather guitar straps are ideal in many situations and our custom embroidered guitar straps are the best on the market. Here at Double Treble, we don't simply understand custom made leather guitar straps; more importantly, we understand you. Our company is run by a team of passionate players that all appreciate the benefits of high quality guitar straps. Whether you're looking for monogrammed guitar straps, embroidered guitar straps, or any other solution, our company can deliver the perfect solution. Whether you have a vision of what you want from your Custom made leather guitar straps or need a little support with the design, we're more than happy to guide you through every step of the process. Double Treble takes great pride in designing, manufacturing, and delivering high quality Custom made leather guitar straps that you can rely on. Every aspect of the product is sure to bring a sense of style and luxury to your setup, making our company the premium supplier of guitar straps on the market. Our custom leather guitar straps have been putting smiles on the faces of America's guitar players for several years, and you'll find that the personalized leather guitar straps will make you want to play more often. So why not join the revolution by turning your love of playing up to 11 with monogrammed guitar straps today? With Double Treble, bringing your dream of personalized guitar straps for acoustic guitars to life couldn't be easier. Whether it's Embroidered guitar straps or another option, our team of experts are happy to help you through every step of the journey, using the latest techniques, skills, and premium grade materials to make your dream accessories a reality. While we take care of every element during production, the final decisions over design will remain in your hands all time. The process of getting personalized leather guitar straps starts with a call to our team at 888-588-2199 or use our builder today.